Post and Beam simply means that the structure is going to be rock solid when it is completed. It is not going to shift and move and settle, which is a common characteristic of log homes. And, because we have eliminated all the settling, we have also eliminated all the ongoing maintenance and annoying problems that are associated with other log homes, like adjusting for doors and windows that get out of square, or pipes that separate when the house settles. These are very important elements to consider in the purchase of your new log home. You want to be satisfied and you want your home to be trouble free. As you learn more about log homes you will begin to understand what settling is all about. 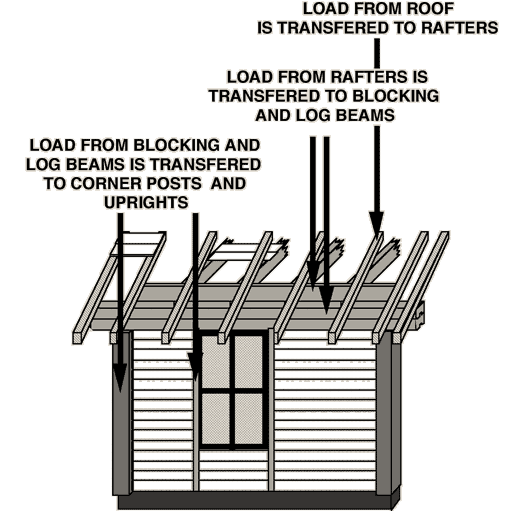 Simply put, the house settles because all the weight of the house, specifically the upper portion, is resting on the horizontal logs that make up the walls of the house. They compress, the house settles and everything moves several inches. With our Post and Beam construction method, we place upright posts next to every door and window. The posts go up to the top of the door and window height, and then beams lay across the posts. The upper portion of the house is built upon the beams which are resting on the upright posts. Therefore, the beams and vertical posts, which do not compress, carry all the weight and the house does not settle! In fact, it is rock solid. You can install your kitchen cabinets, windows and doors without worrying that the walls they are attached to will settle.